Bi-directional interactions between airway smooth muscle (ASM) and the altered extracellular matrix (ECM) may influence airway wall remodelling and ASM function in asthma. We have investigated the capacity of cultured human ASM to reorganise the structure of three-dimensional collagen gels and the effects of endothelin (ET)-1 and agents used to treat asthma. Human ASM cells were cast in type I collagen gels. Reductions in gel area over 72 h were determined in the absence and presence of ET-1 and potential inhibitors, steroids and β2-adrenoceptor agonists. Changes in gel wet weights and hydroxyproline content were measured and ASM gel morphology was examined by scanning electron microscopy. Cell density-dependent reductions in gel area were augmented by ET-1, mediated via ETA receptors. This process was not associated with ASM contraction or proliferation, but was consistent with ASM tractional remodelling and migration leading to collagen condensation rather than collagen degradation within gels. The collagen remodelling by ASM was unaffected by salbutamol and/or budesonide. This study demonstrates an additional potential role for ASM in ECM regulation and dysregulation in airways disease that is resistant to steroids and β2-adrenoceptor agonists. Therapy-resistant collagen condensation within ASM bundles may facilitate ECM-ASM interactions and contribute to increased internal airways resistance. Prominent features of airway wall remodelling (AWR) in asthma include the accumulation of airway smooth muscle (ASM) and an expansion and alteration in the composition of extracellular matrix (ECM), including an increased abundance of collagen type I 1, 2. Increased bi-directional interactions between ASM and the altered pericellular ECM may occur due to these changes. These interactions may be influenced by endothelin (ET)-1, since ET-1 can increase both ASM proliferation and collagen secretion, in addition to its better characterised potent bronchoconstrictor actions 3. The contribution of ASM to fibrogenic changes in ECM synthesis and turnover in asthma has been regarded as minor compared with its contractile role mediating airways hyperresponsiveness 4, 5. In contrast, the contribution of airway fibroblasts to sub-epithelial fibrosis in AWR is well documented 6, 7, with differentiation to a myofibroblast phentoype associated with increased collagen synthesis 8. However, phenotypic modulation of ASM cells from a contractile to a synthetic-proliferative state 5, 9 is also associated with release of an array of pro-inflammatory cytokines and chemokines and the secretion of multiple ECM proteins, including collagen 4. Even if the contribution of ASM to the ECM bulk is modest, ECM can influence critical ASM functions implicated in asthma. In vitro evidence suggests that degradation of the pericellular ECM environment of the ASM could reduce muscle load to facilitate increased muscle shortening 10 while an expanded and stiffer ECM has been associated with reduced distensibility of the airways 11. In addition, the altered ECM surrounding ASM could achieve significance through autocrine/paracrine influences on noncontractile ASM functions, including proliferation, migration and synthesis of secretory products. Culture of ASM on collagen type I has been shown to induce a greater proliferative response to a variety of mitogens and to increase production of eotaxin, RANTES and granulocyte-macrophage colony-stimulating factor 12–15. The capacity of glucocorticoids to modulate ASM-ECM interactions may also be changed in the presence of an altered ECM. Glucocorticoids can exert antiproliferative, antimigratory and anti-inflammatory effects on both fibroblasts and ASM 16, 17, but the steroid sensitivity of these responses is impaired in the presence of denatured (nonfibrillar) type I collagen 13. In addition, increased ECM production in response to profibrotic mediators is also steroid resistant 18. ASM-ECM interactions may also lead to collagen remodelling through cell-mediated reorganisation of the surrounding matrix structure. This process has been extensively studied using human fetal lung (HFL)-1 and adult bronchial fibroblasts seeded in three-dimensional type I collagen gels 19–21 as a model of both wound healing and tissue remodelling. Fibroblast-induced reductions in gel area are generally described as gel “contraction”, and can be accelerated or increased in magnitude by diverse mediators including ET-1 and transforming growth factor-β 19–21. Of particular relevance is the observation that an increase in collagen density mediated by fibroblasts can be further augmented by glucocorticoids 20. Although ASM has also been shown to cause reductions in collagen gel area 19, neither the mechanism for this process nor its regulation by asthma mediators or glucocorticoids has been explored in detail. Given the potential influence of ASM-ECM interactions to contribute to changes in ASM synthetic and contractile function implicated in airway disease, we have used type I collagen gels seeded with human ASM to investigate the potential of these cells to contribute to remodelling of the surrounding ECM. The effects of ET-1 and histamine on this process have been assessed in the presence of various inhibitors and selective receptor antagonists to explore the mechanisms underlying ASM-dependent gel contraction. The effects of glucocorticoids and β2-adrenoceptor agonists have also been examined to explore potential modulation of collagen remodelling by agents used in the treatment of asthma. Human ASM cultures were generated from bronchi from macroscopically normal airways, resected from lung transplant recipients or donors and from pneumonectomy specimens. ASM was microdissected from the bronchus wall and enzymatically digested with collagenase (1 mg·mL−1) and elastase (0.5 mg·mL−1) 22. Cells were maintained at 37°C in 5% CO2 in air in Dulbecco's Modified Eagles Medium (DMEM) (with 2 mM l-glutamine, 0.25% bovine serum albumin (BSA), 100 U·mL−1 penicillin G, 100 μg·mL−1 streptomycin, 2 μg·mL−1 amphotericin B and 10% vol/vol fetal bovine serum). Cells passaged weekly at a 1:4 split ratio were used between passages 3 and 14. The effects of ET-1 (0.1–100 nM) or histamine (0.1–100 μM) on intracellular calcium levels were assessed as previously described 23. ASM were plated at a density of 2×104 cells·mL−1 (4,000 cells·well−1) in 96-well plates and when >90% confluent, DMEM was removed and cells washed twice with hydroxyethyl piperazine ethane sulphonic acid (HEPES)-buffered saline (HBS) buffer (145 mM NaCl, 5 mM KCl, 1 mM MgSO4.7H2O, 10 mM d-glucose, 10 mM HEPES, free acid, 2 mM CaCl2.2H2O, 2.5 mM probenecid, 37°C, pH 7.4). The buffer was then replaced with HBS containing 1 μM Fluo-4 for 60 min at 35°C, before washing. Changes in intracellular Ca2+ concentration evoked by increasing concentrations of agonist were measured over a 2 min period using the Flexstation II (Molecular Devices, Sunnyvale, CA, USA). Flasks of confluent ASM were serum deprived for 72 h in incomplete medium (fetal calf serum-free DMEM, 0.25% weight/vol BSA) to cause growth arrest. Cells were then displaced with 0.5% trypsin, collected and centrifuged (1,500 ×g, 5 min), before resuspension at cell densities of ≤3.75×106 cells·mL−1 in four-times concentrated incomplete DMEM. The cell suspension was immediately mixed thoroughly with fibrillar type I collagen (1.6 mg·mL−1 dialysed rat tail tendon collagen extracted as previously described 24, at 4°C) in a 1:3 ratio and gels were cast in 24-well culture plates (0.5 mL gel·well−1, 37°C, 15 min). Once set, gels were dislodged by adding 1 mL incomplete DMEM, transferred to six-well plates, suspended freely floating in 3 mL incomplete DMEM and incubated for ≤72 h.
The effects of ET-1 (0.1–10 nM) or histamine (0.01–100 μM) on ASM-mediated changes in gel area were assessed. The ET-1 antagonists BQ123 (ETA-selective) and BQ788 (ETB-selective) were used to ascertain whether ET-1 was mediating gel contraction via ETA or ETB receptors, respectively. The activity of these agents was evaluated at 0.1–10 μM, as this concentration range spanned the published pA2 values of 6.9–7.4 for BQ123 and 6.9 for BQ788 25. Inhibitors of phosphoinositide 3-kinase (PI3K) (LY294002, 20 μM), p38 mitogen-activated protein kinase (p38 MAPK) (SB203580, 30 μM) and MEK 1/2 (U0126, 50 μM) were added at concentrations known to cause inhibition in ASM (reviewed in 5). The effects of cytochalasin D (100 nM) and latrunculin A (2 μM) were assessed at concentrations shown to inhibit actin polymerisation within collagen gels 26. cAMP-elevating agents, 8-bromo-cAMP (300 μM) and salbutamol (10–1,000 nM), and glucocorticoids, dexamethasone (10–1000 nM) and budesonide (100 nM), were also tested at appropriate concentrations 13, 22. All potential inhibitors were added 30 min prior to ET-1 (10 nM) where applicable. ASM gel areas were initially determined by the diameter of 24 well culture plates in which they were cast. Areas were then measured at intervals of up to 72 h with an image analyser system (Kodak Image Station 440CF; Eastman Kodak, Rochester, NY, USA). The coefficient of variation determined by repeated measures of area of the same gel was <3%. ASM cells in collagen gels fixed in 2.5% glutaraldehyde in 0.1 M PBS for 2 h were rinsed (3×15 min) and postfixed in 1% osmium tetroxide for 1 h. After rinsing (PBS, 3×15 min), specimens were dehydrated in a graded ethanol series (30, 50, 70, 90 and 100% ethanol in water, 20 min each), critically point dried in a Bal-Tec 030 CPD (Bal-Tec A.G., Balzers, Lichtenstein), and mounted onto 25 mm aluminium stubs with double-sided carbon tabs. Samples were gold-coated in an Edwards S150B sputter coater (Edwards High Vacuum Ltd, Crawley, West Sussex, UK) and imaged in a Philips XL30 (Eindhoven, the Netherlands) field-emission scanning electron microscope at 2 kV. ASM-containing gels were incubated with 3-[4, 5-dimethylthiazol-2-yl]-2,5-diphenyltetrazolium bromide (MTT, final concentration 1 mg·mL−1, overnight, 37°C), washed (two times with PBS) and digested with collagenase (0.25 mg·mL−1, 37°C, 2 h). After centrifugation (10,000×g, 5 min), 400 μL dimethyl sulfoxide was added to the cell pellet to solubilise the blue formazan product, which was then quantified by reading absorbance at 550 nm (method modified from 27). The linear relationship between increasing cell density and absorbance measured in gels seeded with ASM at densities of up to 3.75×106 cells·mL−1 was maintained after 72 h (supplementary fig. A). Gel supernatants were assayed for proteolytic matrix metalloprotease (MMP) activity by gelatin zymography, using conditioned media from human cultured ASM as an internal control. Image capture and densitometry were performed using Kodak 1D software (Eastman Kodak) as previously described 28. Gels were collected to determine wet weights and acid lysates of freeze-dried gels were subsequently assayed for total hydroxyproline as an index of collagen content, as previously described 29. Migration of ASM was assessed with a wound assay 30. Cells were grown to confluence in 24 well plates, then serum-starved in incomplete media for 24 h before treatment with 200 nM Mitotracker Green (Molecular Probes for 2 h). The cells were washed twice with PBS and fresh incomplete media was added. The cell layer was scraped with a pipette tip and cells were then incubated in the absence and presence of ET-1 (10 nM) for 18 h. The wound edge was viewed and photographed using live cell imaging (Leica DMI 6000B; Leica, Milan, Italy) at 30-min intervals. Changes in wound area with time were analysed using VideoSavant™ software (IO Industries Inc., London, ON, Canada). All data were expressed as the mean±sem of the response from n different primary cultures, each from a different donor, and analysed using Graph Pad Prism™ software version 4.0 (GraphPad Software, La Jolla, CA, USA). Effects of time and either cell density or drug concentration were tested by two-way repeated measures ANOVA on raw area values. Effects of inhibitors were examined by paired t-tests or by one-way repeated measures ANOVA, followed by Bonferroni post hoc tests for multiple comparisons. Differences were considered to be statistically significant when p<0.05. To determine whether ASM could mediate collagen remodelling, gels were prepared in the absence and presence of ASM cells at varying numerical density. There was no change in area of cell-free collagen gels over 72 h (fig. 1a and b). Reductions of up to 50% in area were evident in gels prepared using ASM at increasing cell densities ranging 0.625–3.75×106 cells·mL−1 (fig. 1c). Collagen gel area is reduced with time; a) t = 0 and b) t = 72 and c) cell density in airway smooth muscle (ASM) gels. Gel areas showing effect of ASM cell density (0.625–3.75×105 cells·mL−1) over 72 h are expressed as mean±sem (n = 5) with error bars only shown for selected data sets for clarity. Cell density (×105 cells·mL−1): ○: 0; ▴: 0.625; ▾: 1.25; ♦: 1.875; •: 2.5; ▪: 3.75. ·····: represents initial gel area. Two-way ANOVA with repeated measures, p<0.001 for time, p<0.05 for cell density. The morphology of ASM within gels was examined using scanning electron microscopy. Multiple interactions between ASM and surrounding collagen fibres were evident immediately after gels were cast (t = 0, fig. 2a). Although ASM cells initially appeared rounded, they were clearly elongated after 72 h (fig. 2b). Increased density of collagen fibres was evident within the gels with time (fig. 2a and b) and with increasing ASM density (fig. 2c and d). Collagen density is increased with time and airway smooth muscle (ASM) cell density. 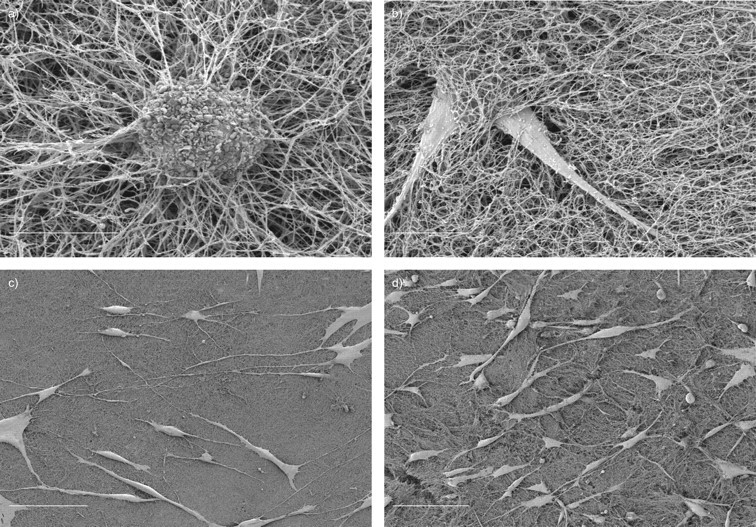 Scanning electron micrographs of collagen gels seeded with ASM were prepared as described in the Methods. Gels seeded at an ASM density of 2.5×105 cells·mL−1 for a) t = 0 and b) t = 72 h. Scale bars = 10 μM. Gels seeded at ASM densities of c) 0.625×105 cells·mL−1 (low density) and d) 3.75×105 cells·mL−1 (high density), both at t = 72 h. Scale bars = 100 μM. Subsequent studies were performed at an ASM density of 2.5×106 cells·mL−1, at which initial gel areas were reduced by 13±3% within the first 4 h (n = 19, p<0.05 in comparison with t = 0). This density was chosen to permit assessment of augmentation or inhibition of sub-maximal reductions in gel area. To determine the potential contribution of active contraction of ASM to ASM-mediated reductions in gel area, the effects of ET-1 and histamine were assessed. To demonstrate that functional receptors for these contractile agonists were expressed, their effects on calcium mobilisation were measured in cultured ASM. 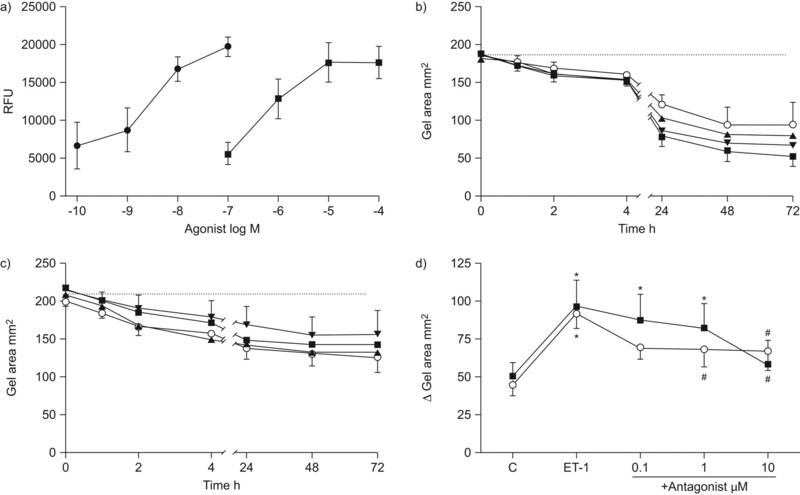 Increases in intracellular calcium were evident within minutes in the presence of both ET-1 and histamine over the concentration ranges tested in the collagen gel assay, with ET-1 being more potent (fig. 3a). 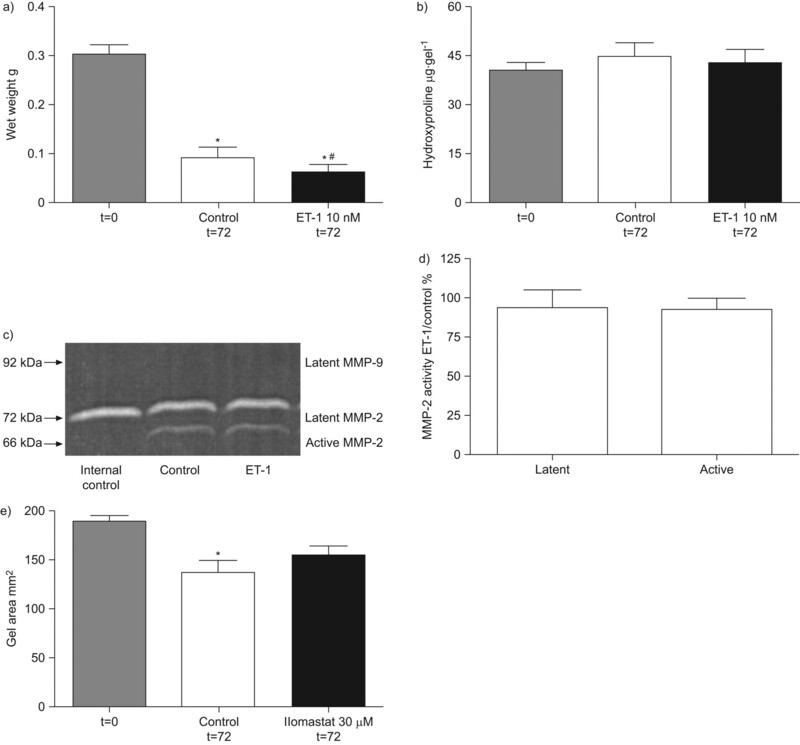 Endothelin (ET)-1, but not histamine, increases airway smooth muscle (ASM) gel contraction. a) Effect of ET-1 (• 0.1–10 nM) and histamine (▪ 0.01–10 μM) on calcium mobilisation in cultured ASM. Relative fluorescence units (RFU) in response to 2 min incubation with agonists are expressed as mean±sem (n = 4). Effect of b) 0.1–10 nM ET-1 (○: 0 nM; ▴: 0.1 nM; ▾: 1.0 nM; ▪: 10.0 nM) and c) 0.01–100 μM histamine (○: 0 μM; ▴: 0.01 μM; ▾: 1.0 μM; ▪: 100.0 μM) on collagen gels seeded with ASM (2.5×105 cells·mL−1). Gel areas over 72 h are expressed as mean±sem (ET-1 n = 5, two-way ANOVA, p<0.001; histamine n = 4). Error bars are only shown for selected data sets for clarity. d) Effect of pre-incubation with ET-1 antagonists BQ123 (○: ETA-selective) or BQ788 (▪: ETB-selective) (0.1–10 μM) on reduction in gel area with ET-1 (10 nM). Changes in gel area after 24 h are expressed as mean±sem (n = 5) from initial areas of 203±3 mm2. C: control. ·····: represents initial gel area. *: p<0.05 in comparison with control; #: p<0.05 in comparison with ET-1 alone. 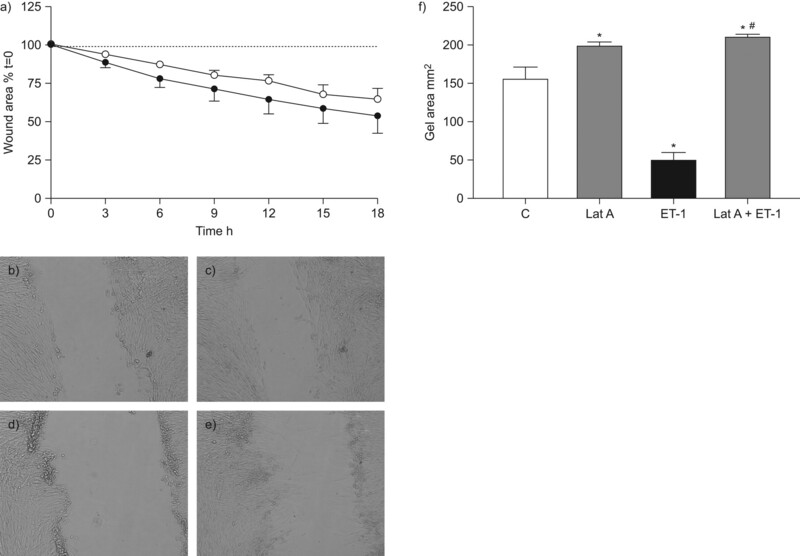 Despite both agonists inducing calcium mobilisation, only ET-1 (0.1–10 nM) augmented collagen remodelling in a concentration-dependent manner, (fig. 3b, 2-way ANOVA; p<0.05) while histamine (0.01–100 μM) had no effect (fig. 3c). The receptor-dependence of ET-1 responses were examined using the selective antagonists, BQ123 and BQ788, which display >10,000-fold selectivity for ETA and ETB receptors respectively 25 (fig. 3d). The antagonists did not affect gel area in the absence of ET-1 (data not shown). The response to 10 nM ET-1 (gel area at t = 72 h: 42±3% initial area, n = 5) was prevented by preincubation with the ETA antagonist BQ123 (0.1 μM, p<0.05 in comparison with ET-1 alone). In contrast, BQ788 was only effective at 10 μM, a concentration 100-fold greater than its pA2 value at the ETB receptor. The potential contribution of ongoing ASM proliferation within gels was assessed, measuring MTT metabolism as a marker of cell density. In gels seeded with ASM at an initial density of 2.5×105 cells·mL−1, absorbance values for conversion of MTT were not altered during collagen remodelling (2.3±0.4 at t = 0 in comparison with 2.7±0.6 at t = 72 h, n = 8; p>0.05, paired t-test). Although the reduction in gel area after 72 h was greater in the presence of ET-1, absorbance values were not increased (2.0±0.5 for control in comparison with 1.6±0.4 for ET-1, n = 8, p>0.05, paired t-test). Wound assays in the absence and presence of ET-1 were performed to determine whether ASM migration could contribute to reductions in gel area when ASM were seeded within type I collagen gels. The reduction in wound area under control conditions over 18 h was increased with ET-1 treatment in three of the four ASM cultures tested (fig. 4a–e). Effect of endothelin (ET)-1 on airway smooth muscle (ASM) migration, and effects of inhibitors of actin polymerisation on ASM gel contraction. a–e) Using a wound assay, migration of ASM with time were assessed in the absence and presence of 10 nM ET-1. a) Data are expressed as mean±sem % reduction in wound area over 18 h (n = 4). ○: control; • ET-1; ·····: represents initial wound area. b) Control, t = 0, c) control, t = 18 h, d) +10 nM ET-1, t = 0, e) +10 nM ET-1, t = 18 h. f) ASM gel areas were measured in the absence and presence of 10 nM ET-1 following 30 min pre-incubation with latrunculin A (Lat A, 2 μM, n = 4). Initial gel areas were 197±2 mm2. Gel areas at 24 h are expressed as mean±sem. C: control. *: p<0.05 in comparison with control; #: p<0.05 in comparison with ET-1. To examine the dependence of gel contraction on the assembly of monomeric actin into actin filaments, gels were incubated in the presence of cytochalasin D and latrunculin A. Both inhibitors of actin polymerisation inhibited gel contraction, with cytochalasin D reducing the change in gel area under control conditions by 42±11% (n = 4; p<0.05). Latrunculin A was more effective, completely abolishing changes in gel area with time in the absence and presence of ET-1 (fig. 4f). The signalling pathways associated with reductions in gel area were also assessed. Inhibition of p38 MAPK by SB203580 and of PI3K by LY294002 partially inhibited reductions in gel area under control conditions by 69±21% and 31±7%, respectively (n = 4, p<0.05, paired t-test). The augmented response to ET-1 was still evident in the presence of both inhibitors, while the MEK1/2 inhibitor U0126 had no detectable effect on collagen remodelling in the absence or presence of ET-1 (data not shown). Given the significant reduction in area of untreated ASM gels with time, changes in gel weights were also measured. There was a significant decrease in gel wet weight (gel volume) after 72 h by 60±11% in control gels (p<0.01 in comparison with t = 0, fig. 5a). This was further decreased to a loss in wet weight of 72±8% with ET-1 treatment (p<0.01 in comparison with control, fig. 5a). Effect of airway smooth muscle and endothelin (ET)-1 on gel weight, hydroxyproline content and supernatant matrix metalloprotease (MMP) activity. Gels and supernatants were collected after 72 h incubation in the absence and presence of 10 nM ET-1. a) Wet weight and b) hydroxyproline content were measured at t = 0 (n = 4) or after 72 h (n = 14). c) Supernatants were assayed for MMP activity by gelatin zymography. d) Activity is expressed as ratio of densitometry values for either latent or active MMP-2 in the presence and absence of ET-1 (10 nM, n = 8). Conditioned media from human cultured airway smooth muscle was used as an internal control. e) The effect of ilomastat (30 μM) on gel areas (n = 6). All data are expressed as mean±sem. *: p<0.05 in comparison with t = 0; #: p<0.05 in comparison with control. To determine if the reduced weight was due to loss of collagen as well as water, the hydroxyproline content of ASM gels was assayed. Initial hydroxyproline content averaged 7.4±0.4% of the dry gel weight (n = 4). Hydroxyproline could not be detected in the supernatants collected at 72 h, and the content within gels was not changed with time or with ET-1 treatment (fig. 5b). The role of MMPs in regulation of collagen remodelling was then examined. Both latent and active MMP-2 activity, but not MMP-9 activity, was detected in ASM gel supernatants collected at 72 h (fig. 5c). There was no detectable increase in MMP activity in gel supernatants in the presence of ET-1 (n = 8, fig. 5c and d). Reductions in ASM gel area with time were not inhibited by the non-selective MMP inhibitor, ilomastat (fig. 5e). The potential regulation of gel contraction by agents that relax ASM and by glucocorticoids was also assessed. Preincubation with the β2-adrenoceptor agonist salbutamol did not affect the rate or extent of the reduction in gel area in control or ET-1-treated gels (fig. 6a). The lack of effect of this cAMP-elevating agent was consistent with results obtained using the stable analogue 8-bromo-cAMP (fig. 6b). At concentrations up to 1,000 nM, the glucocorticoid dexamethasone did not modulate the extent of gel contraction in the absence or presence of ET-1 (table 1). Preincubation with budesonide alone or in combination with salbutamol did not affect the reduction in gel area in control or ET-1-treated gels (fig. 6c). The effect of agents used to treat asthma on gel contraction. Collagen gel areas were measured in the absence (control) or presence of 10 nM endothelin (ET)-1, following 30 min pre-incubation with the following agents. a) Salbutamol (10–1000 nM) (n = 3). Control + salbutamol (nM): ○: 0; ▵: 10; ▿: 100; □: 1000. ET-1 + salbutamol (nM): •: 0; ▴:10; ▾: 100; ▪: 1000. ·····: represents initial gel area. b) 8-bromo cAMP (▒) (300 μM, 24 h, n = 3). c) Salbutamol (░;100 nM), budesonide (▒;100 nM) or salbutamol + budesonide (▪) (24 h, n = 6). Gel areas are expressed as mean±sem. *: p<0.05 in comparison with t = 0, #: p<0.05 in comparison with control. In the present study, reductions in the area of three-dimensional type I collagen gels seeded with ASM were cell-density dependent and increased by ET-1 acting via ETA receptors. This process did not appear to involve myocyte contraction, since it occurred over a much longer timecourse than is usually associated with smooth muscle shortening and force development. In addition, responses were not mimicked by histamine or prevented by agents that relax ASM. Interactions between ASM and the surrounding matrix were associated with increasing collagen fibre density rather than collagen degradation, consistent with tractional remodelling as ASM migrate through the collagen gel. This collagen remodelling was resistant to treatment with glucocorticoids, and could contribute to increased collagen density in bundles of ASM in situ in asthmatic airways. This process has the potential to influence diverse airway smooth muscle functions, including proliferation, migration and cytokine production, in addition to changing the physical properties of the cells to oppose both muscle shortening and lengthening. Cell-mediated collagen gel contraction has been widely used as an in vitro model to study tissue remodelling and wound healing by fibroblasts in the context of fibrotic diseases 31, 32. Very few studies have examined ASM-mediated remodelling of collagen gels 19, 33. Given the potential for changes in ASM-ECM interactions to influence ASM contractile and synthetic function in airways disease, we sought to explore this in vitro process and the potential mechanisms involved in its regulation. 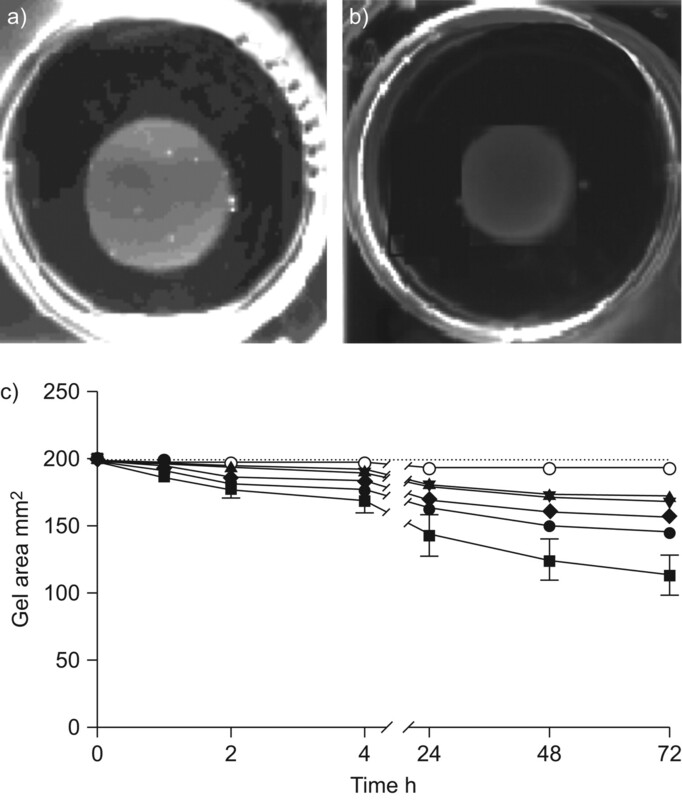 The area of floating collagen gels seeded with ASM spontaneously reduced within several hours in the absence of an exogenous contractile stimulus. In studies using fibroblast gels, this area reduction has been attributed to the isometric tension applied to the collagen fibrils as the fibroblasts develop a myocyte-like shortening 34. However, in the current study, the progressive reduction in ASM gel area occurring over several days in the absence of exogenous stimuli was not consistent with acute ASM shortening. Although this apparent “contraction” increased with ASM density, scanning electron microsopy in contracted gels showed that the appearance of cells within gels remained elongated irrespective of the extent of the reductions in gel area. Despite evidence that ET-1 and histamine, both contractile agonists of ASM, could elicit calcium mobilisation in cultured ASM within minutes, the reduction in ASM gel area was augmented by ET-1, but not by histamine. These data suggest that the ET-1-induced collagen remodelling may also be independent of active contraction of ASM within collagen gels. In support of this, the response to ET-1 was mediated via the ETA receptor, rather than the ETB receptor responsible for ASM contraction 35. In addition, neither the stable cAMP analogue 8-bromo-cAMP nor the β2-adrenoceptor agonist salbutamol that act as functional antagonists to oppose ASM contraction were able to inhibit the response. Limits to diffusion of these agents into the gels do not appear to explain this lack of effect, since reductions in gel area were shown to be inhibited by preincubation with various chemically dissimilar agents, and the response to ET-1 could be inhibited by the selective ETA antagonist BQ123. The finding that histamine did not elicit a reduction in ASM gel area was contrary to a previous report 36 where a 10–20% maximal reduction in gel area in response to 100 μM histamine was evident within 20 min. However, in the protocol used by Matsumoto et al. 36, gels were either left attached in the casting plate overnight (so-called “pre-stressed” gels) or had already achieved the maximum ASM-mediated reduction prior to drug addition. In the current study, the initial gel area was not stabilised before histamine was added so that a small acute response to histamine may not have been detected if it was occurring simultaneously upon release of the newly cast gels. Nevertheless, the ongoing progressive reductions in gel area either in the absence or presence of ET-1 of up to 75% over several days provide evidence that active muscle contraction is not the principal mechanism for the long-term remodelling of the collagen matrix observed. As described here with ASM gels and in previous studies using fibroblasts 31, increased cell density resulted in greater collagen remodelling. A contribution of ASM proliferation is possible, since denatured (non-fibrillar) type I collagen has been shown to enhance ASM proliferation 13, 14. However, significant reductions in ASM gel area occurred within 24 h, much earlier than the population doubling time of ASM of 36–48 h 27. Furthermore, we have shown that the fibrillar type I collagen matrix used in these gel contraction experiments is anti-mitogenic 37. ET-1 has been reported to elicit a small increase in DNA synthesis in ASM via ETA receptors, but appears to require co-mitogens for a significant increase in cell number 22, 38. In the current study, the gel remodelling response to ET-1 was not sensitive to inhibition of the PI3K or extracellular signal-regulated kinase pathways that are required for ASM proliferation 5. Moreover, cell numbers and viability were stable over the duration of the experiments regardless of the presence of ET-1. Therefore, it appears that collagen remodelling within gels is independent of ASM proliferation. Alternative mechanisms for reductions in the area of collagen gels include gel dehydration and/or collagen breakdown 31, 39. In the current study, scanning electron micrographs of contracted ASM gels showed condensation of collagen fibrils around the cells. Since the reductions in gel wet weights with time were not accompanied by reductions in hydroxyproline content, it is unlikely that the collagen fibrils were undergoing degradation. A previous study also using ASM seeded in collagen gels did not detect ECM degradation unless ASM were co cultured with monocytes or incubated with neutrophil elastase 33. An alternative mechanism suggested for cell-mediated contraction of gels is the tractional remodelling of the collagen lattices occurring as a consequence of cell migration through the matrix, as has been described for fibroblasts 32, 40. Consistent with this, we have demonstrated the capacity of ASM cultures used in the gel experiments to migrate in a wound assay. The potential contribution of migration to ASM-mediated collagen remodelling is supported by the finding that the spontaneous reduction in gel area in this study was partially inhibited by SB203580, since the p38 MAPK pathway has previously been implicated in ASM migration 41. Critically, gel contraction was also prevented by inhibitors of actin polymerisation that disrupt the cytoskeletal elements required for ASM traction and migration 42. Remodelling of ASM collagen gels may be dependent on MMP activity to release cells from their matrix connections, as has been reported for fibroblast gels 43. Although MMP-2 activity was detected in supernatants from ASM gels, the non-selective MMP inhibitor ilomastat did not inhibit ASM-mediated reductions in gel area. Although ET-1 has been shown to upregulate the expression of MMPs in association with vascular remodelling 44, enhanced collagen remodelling of ASM gels with ET-1 was not associated with an increase in MMP-2 activity. The findings suggest that MMP activity is not a requirement for collagen remodelling by ASM. Given the potential influence that ASM-mediated collagen remodelling may have on diverse ASM cell functions in the airways, it was of interest to determine whether ASM gel contraction is modulated by agents used to treat asthma. The finding that salbutamol, which causes ASM relaxation, was ineffective was consistent with the evidence already presented that reductions in ASM gel area were due to collagen remodelling rather than acute ASM shortening. However, if the condensation of the collagen gels does require tractional remodelling and migration by ASM, an inhibitory effect of salbutamol may have been anticipated, since it has previously been reported that agents that mobilise cAMP inhibit migration of human ASM 45. The lack of effect on reductions in ASM gel area requires further investigation to determine whether signalling by β2-adrenoceptor agonists is impaired in ASM embedded in a 3-dimensional collagen matrix, as has been reported for glucocorticoid signalling when ASM were grown on collagen 13. Neither dexamethasone nor budesonide regulated reductions in ASM gel area. The lack of effect of this drug class on ASM-mediated collagen remodelling is consistent with other studies examining steroid modulation of diverse ASM functions. Glucocorticoids do not regulate ECM production by ASM in response to profibrotic mediators 18, and their inhibitory effects on ASM proliferation and migration are impaired in the presence of collagen, due to increased α2-β1-integrin signalling 13. However, the findings in ASM collagen gels are in contrast with studies showing that HFL-1 gel contraction is augmented by budesonide or hydrocortisone 20, 46. Although fibroblasts and ASM have a common action in mediating collagen remodelling, it is possible that differential regulation of this process in lung mesenchymal cells may determine their relative contributions to ongoing remodelling in health and disease. In conclusion, this study demonstrates an additional potential role for ASM in the dynamic regulation of ECM and its dysregulation in airways disease that is resistant to the effects of both glucocorticoids and β2-adrenoceptor agonists. This cell-dependent process could increase the collagen density in bundles of ASM in situ, and further facilitate ASM-ECM interactions, with the potential for profound effects on airway function. Ultimately, ASM-mediated gel contraction may provide a useful screen for identification of selective agents to prevent cell-mediated collagen remodelling in lung diseases including asthma. We thank J. Wilson (Dept Allergy, Immunology and Respiratory Medicine, Alfred Hospital, Melbourne, Australia) and the anatomical pathologists at the Alfred Hospital (Melbourne) for facilitating the provision of human lung samples, S. Langenbach (Dept of Pharmacology, University of Melbourne) for preliminary assistance with hydroxyproline measurements and S. Crawford (Dept of Pharmacology, University of Melbourne) for assistance with preparation of samples for electron microscopy. This work was supported by the National Health and Medical Research Council (Grants 299823, 509001, 509239); Contributing to Australian Scholarship and Science (CASS) Foundation; ANZ Medical Research and Technology in Victoria Fund, Australian Academy of Science and Asthma Foundation of Victoria.
. Airway wall remodelling in asthma: a novel target for the development of anti-asthma drugs. Trends Pharmacol Sci 1993; 14: 275–279.
. Remodelling of airway smooth muscle in asthma: what sort do you have? Clin Exp Allergy 2005; 35: 703–707.
. Putative mediator role of endothelin-1 in asthma and other lung diseases. Clin Exp Pharmacol Physiol 1999; 26: 168–171.
. Synthetic responses in airway smooth muscle. J Allergy Clin Immunol 2004; 114: S32–S50.
. Proliferative aspects of airway smooth muscle. J Allergy Clin Immunol 2004; 114: S2–S17.
. Subepithelial fibrosis in the bronchi of asthmatics. Lancet 1989; 1: 520–524.
. Myofibroblasts and subepithelial fibrosis in bronchial asthma. Am J Respir Cell Mol Biol 1990; 3: 507–511.
. Heterogeneity of myofibroblast phenotypic features: an example of fibroblastic cell plasticity. Virchows Arch 1994; 425: 3–24.
. Molecular mechanisms of phenotypic plasticity in smooth muscle cells. J Appl Physiol 2001; 90: 358–368.
. Collagenase increases shortening of human bronchial smooth muscle in vitro. Am J Respir Crit Care Med 1995; 152: 1513–1517.
. The lack of distensibility of asthmatic airways. Am Rev Respir Dis 1993; 148: 806–809.
. Effects of growth factors and extracellular matrix on survival of human airway smooth muscle cells. Am J Respir Cell Mol Biol 2001; 25: 569–576.
. Collagen impairs glucocorticoid actions in airway smooth muscle through integrin signalling. Br J Pharmacol 2006; 149: 365–373.
. β1-integrins mediate enhancement of airway smooth muscle proliferation by collagen and fibronectin. Am J Respir Crit Care Med 2005; 171: 217–223.
. Multiple β1 integrins mediate enhancement of human airway smooth muscle cytokine secretion by fibronectin and type I collagen. J Immunol 2005; 174: 2258–2264.
. The effect of glucocorticoids on proliferation of human cultured airway smooth muscle. Br J Pharmacol 1995; 116: 3219–3226.
. Proliferation is not increased in airway myofibroblasts isolated from asthmatics. Eur Respir J 2008; 32: 362–371.
. A phosphodiesterase 4 inhibitor inhibits matrix protein deposition in airways in vitro. J Allergy Clin Immunol 2006; 118: 649–657.
. Th2 cytokine regulation of type I collagen gel contraction mediated by human lung mesenchymal cells. Am J Physiol Lung Cell Mol Physiol 2002; 282: L1049–L1056.
. Glucocorticoids and TGF-β1 synergize in augmenting fibroblast mediated contraction of collagen gels. Inflammation 2001; 25: 109–117.
. Endothelin-1 promotes myofibroblast induction through the ETA receptor via a rac/phosphoinositide 3-kinase/Akt-dependent pathway and is essential for the enhanced contractile phenotype of fibrotic fibroblasts. Mol Biol Cell 2004; 15: 2707–2719.
. Inhibition by salbutamol of the proliferation of human airway smooth muscle cells grown in culture. Br J Pharmacol 1994; 111: 641–647.
. Selenosartans: novel selenophene analogues of milfasartan and eprosartan. Bioorg Med Chem Lett 2008; 18: 1241–1244.
. Collagen substrata for studies on cell behavior. J Cell Biol 1972; 54: 626–637.
. Classification of endothelin receptors and antagonists in clinical development. Clin Sci (Lond) 2002; 103: Suppl. 48, 1S–3S.
. Effects of cytochalasin D and latrunculin B on mechanical properties of cells. J Cell Sci 2001; 114: 1025–1036.
. Quantifying proliferation of cultured human and rabbit airway smooth muscle cells in response to serum and platelet-derived growth factor. Am J Respir Cell Mol Biol 1992; 7: 574–581.
. The PPAR γ ligand, rosiglitazone, reduces airways hyperresponsiveness in a murine model of allergen-induced inflammation. Pulm Pharmacol Ther 2006; 19: 39–46.
. Resistance of fibrogenic responses to glucocorticoid and 2-methoxyestradiol in bleomycin-induced lung fibrosis in mice. Can J Physiol Pharmacol 2007; 85: 727–738.
. Alterations of Ca2+ mobilizing properties in migrating endothelial cells. Am J Physiol Heart Circ Physiol 2001; 281: H745–H754.
. Production of a tissue-like structure by contraction of collagen lattices by human fibroblasts of different proliferative potential in vitro. Proc Natl Acad Sci USA 1979; 76: 1274–1278.
. Fibroblast-collagen-matrix contraction: growth-factor signalling and mechanical loading. Trends Cell Biol 2000; 10: 362–365.
. Interactions between monocytes and smooth-muscle cells can lead to extracellular matrix degradation. J Allergy Clin Immunol 2001; 108: 989–996.
. Effect of cell migration on the maintenance of tension on a collagen matrix. Ann Biomed Eng 1999; 27: 721–730.
. Endothelin-1 receptor density, distribution, and function in human isolated asthmatic airways. Am J Respir Crit Care Med 1995; 152: 1653–1658.
. Comparison of gel contraction mediated by airway smooth muscle cells from patients with and without asthma. Thorax 2007; 62: 848–854.
. Fibrillar collagen clamps lung mesenchymal cells in a non-proliferative and non-contractile phenotype. Am J Respir Cell Mol Biol 2009; 41: 731–741.
. Endothelin-1-induced potentiation of human airway smooth muscle proliferation: an ETA receptor-mediated phenomenon. Br J Pharmacol 1996; 118: 191–197.
. Thrombin and TNF-α/IL-1β synergistically induce fibroblast-mediated collagen gel degradation. Am J Respir Cell Mol Biol 2006; 35: 714–721.
. Cell locomotion forces versus cell contraction forces for collagen lattice contraction: an in vitro model of wound contraction. Tissue Cell 1990; 22: 407–417.
. A role for p38(MAPK)/HSP27 pathway in smooth muscle cell migration. J Biol Chem 1999; 274: 24211–24219.
. Migration of airway smooth muscle cells. Proc Am Thorac Soc 2008; 5: 97–105.
. Fibroblasts regulate contractile force independent of MMP activity in 3D-collagen. Biochem Biophys Res Commun 2003; 312: 725–732.
. Stress upregulates arterial matrix metalloproteinase expression and activity via endothelin A receptor activation. Am J Physiol Heart Circ Physiol 2003; 285: H2225–H2232.
. Cyclic AMP-mobilizing agents and glucocorticoids modulate human smooth muscle cell migration. Am J Respir Cell Mol Biol 2003; 29: 19–27.
. Glucocorticoids augment fibroblast-mediated contraction of collagen gels by inhibition of endogenous PGE production. Proc Assoc Am Physicians 1999; 111: 249–258.